VINTAGE OLD DETROIT STROH'S BREWERY 1920's BEER GLASS photo picture art print for sale. 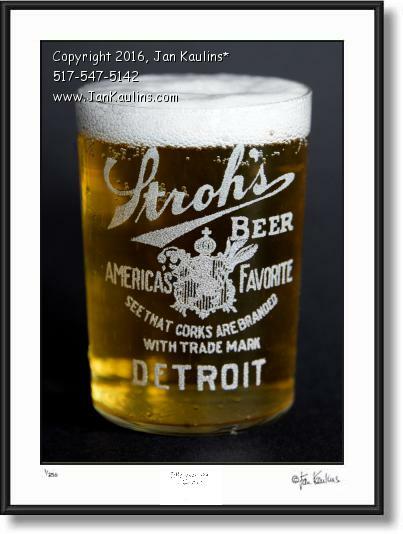 This vintage 1920's DETROIT STROH'S BREWERY BEER ADVERTISING GLASS photo picture print for sale is a multiple bracketed exposure photo of this rare pre-Prohibition Detroit Stroh's beer glass, filled with Stroh's Beer. The glass has been etched with the famous STROH'S signature logo and with the cautionary words "See that corks are branded with Trademark Detroit" These small glasses were produced from about the late 1800's through 1920 when Prohibition began. They were rarely sold---they were mostly 'thank you' giveaways to the bar owners who carried their product. Beneath it is etched 'DETROIT', the home of The Stroh's Brewery. These glasses were often given to bar owners and clients of Stroh's Beer as thank you for carrying their product, making them quite rare. The glass was also very thin, so not too many have survived close to a hundred years like this unique item. Thirteen years later in 1933, when Prohibition ended, these glasses were no longer produced. This is an artistic studio portrait photographic rendering of this iconic vintage Stroh's beer glass.